If you have lots of containers to fill, especially large pots and planters, save money big-time by blending your own potting soil. It takes just minutes! Save moola on potting soil and still give your container plants the best growing medium possible. • Buy in large quantities. Buy quality brand-name potting soil in big bags. (Cheap potting soils tend to have poor-quality blends of ingredients that don’t help plants in the long run.) Keep clipped or tied shut when not using so it doesn’t dry out. I might be hard to re-wet, depending on its composition. • In large pots and planters, you really need only 8 inches or so for most annuals. Fill the bottom with ordinary garden soil. • If weight is an issue, as it is in windowboxes and large containers you want to move around, put a few plastic soda bottles (lids on) in the bottom to take up space at minimal cost. 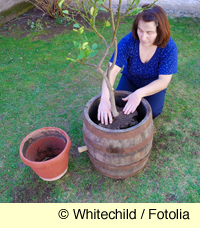 • Or invert a plastic pot over the drainage hole to minimize the amount of potting soil needed. • If you use lots of potting soil, mix up your own. Far cheaper than buying several large bags. Blend together with a trowel or small spade in a wheelbarrow. Adjust proportions as desired to create a consistency you like. Variation: If desired, add Osmocote or another granular fertilizer as directed on the package and mix in. It will slow feed your plants for several weeks. Variation: If desired, add water-retaining polymer crystals to the water, as directed in the package. (Be careful not to put in too much or you'll have a mess once you water. Use very, very sparingly, following package directions.) I find this cuts my watering by as much as half. * Preferably from your compost heap. Or purchase in bags. Read the labels carefully—they're confusing. Go for a product labeled simply "compost." Avoid products labeled as a composted manure since it will be too rich. Or purchase in bags. Read the labels carefully--they're confusing. Go for a product labeled simply "compost." Avoid products labeled as a composted manure since it will be too rich.